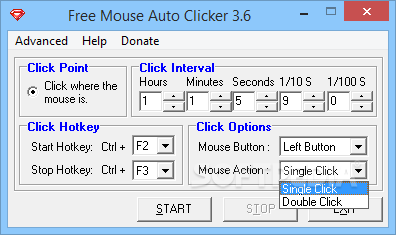 Free Mouse Auto Clicker is a software that can free you from repeat mouse click work. It’s simple but enough for normal use. The software is straightforward enough to be encompassed into your everyday, normal workflow. You can desire clicks per seconds and it will automatically work according to your selected value. Also you have an ability to change delay between clicks. The bottom line is that Free Mouse Auto Clicker is a nice program that is quite light on the computer’s resources.